JULY IS NATIONAL ICE CREAM MONTH. WE MINNESOTANS SUFFER THROUGH MONTHS OF COLD AND SNOW SO THAT WE CAN EARN THE PLEASURES OF GLORIOUS HOT SUMMER DAYS WITH CREAMY ICE CREAM DRIPPING DOWN OUR CHINS. Rochester is lucky to have not one, but two Flapdoodles locations for true, homemade ice cream. Owners Vicki and Matt Tierney, along with their daughters, Paige and Abby, opened the doors of the first store in 2011. Matt grew up in Alaska, and Flapdoodles was the name of his dad’s sailboat there. The funny word means “foolish talk,” and the stores are a blend of sailing and silliness. The north store located near Target north, and the south store on South Broadway, are, according to Matt, “a place to enjoy homemade ice cream, but also a place for people to come and hang out.” One of their most popular ice cream flavors is strawberry, a simple blend of strawberries, vanilla, cream and sugar. Another popular flavor is cheesecake with berries. 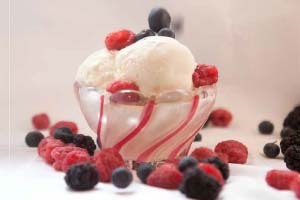 They also make all-natural sorbet flavors such as banana, blueberry, raspberry, strawberry and lemonade. This entry was posted in Food on July 11, 2018 by BY EMILY WATKINS, Photography By DAWN SANBORN. GARDENAIRE FOUNDER AND ROCHESTER NATIVE AMY LORBER HAS ALWAYS ENJOYED WORKING IN A GARDEN AND HARVESTING PRODUCE AT THE PEAK OF ITS FRESHNESS. GROWING UP, HER FAMILY PRESERVED THE BOUNTY FROM THEIR GARDEN BY MAKING APPLESAUCE, SOUP, TOMATO SAUCE AND A VARIETY OF JAMS TO ENJOY THROUGHOUT THE WINTER. AS A RESULT, AMY HAS FOND CHILDHOOD MEMORIES OF PRESERVING FOOD—CAPTURING THE ESSENCE OF SUMMER—TO LATER BE SAVORED LIKE A BURST OF WARM SUNSHINE. Because of her lifelong interest in preserving food, Amy also wanted to get involved in Rochester’s vibrant organic, local and sustainable food community. The result: Gardenaire was birthed soon after Amy’s return to Minnesota. This entry was posted in Food on July 1, 2018 by CINDY MENNENGA. Forager’s female chefs talk about food and the funny side of the kitchen. KARI DAVI GREW UP IN RAWLINS, WYOMING AND MOVED TO ROCHESTER IN SEPTEMBER 2015. HER AUNT, WHO LIVES HERE, TOLD HER HOW THE FOOD SCENE HAS BEEN GROWING IN ROCHESTER, SO SHE CAME TO BE A PART OF IT. SHE INTENDS TO REMAIN HERE FOR THE NEXT FIVE YEARS. Kari has known she wanted to be a chef since the time she was 18. She was already a line cook and thought, “I could spend the rest of my life in a kitchen.” She set off to get her training in line cooking, prepping ingredients and assembling dishes according to restaurant recipes and specifications. She spent two years training in Wyoming, followed by attending the Art Institute of Tucson. This entry was posted in Food on November 1, 2017 by By Dawn Sanborn Photography by Dawn Sanborn Photography. Does the word “gourmet” intimidate you? It did me until almost 10 years ago when our neighbors invited us to participate in a gourmet club with a few other couples. They pulled together people they knew who enjoyed eating good food. At our first meeting, the only people we knew were our neighbors. While I was growing up, my parents participated in a formal gourmet group. The host decided on the menu and assigned specific recipes to each person. That’s what I had in mind for our gourmet group, but as we talked through things, we decided on something much more casual. The only hard and fast rule was that each person had to make and bring something that they had never cooked. We would meet as often as we could (usually every other month or so), taking turns hosting. The host would cook the main dish, and the others would bring appetizers, side dishes, salads, bread and/or dessert, along with wine or cocktails. Once the main dish was decided, the others could plan their dishes around that. It always felt very casual, with everyone contributing what they could and felt like making. We have tried many new dishes with our gourmet club including cow’s tongue, pork belly and even squirrel! We’ve had duck, Lebanese roasted fish, chicken shawarma (thinly sliced meat wrapped in pita bread with veggies and sauce), salads, different kinds of breads and many creative vegetable dishes. We often have such great appetizers that it seems to diminish our appetite for dinner, but we always have room for our main dish and dessert. We’ve had pumpkin creme brulee, raspberry clafoutis (a French dessert) and dorayaki (a type of Japanese confection). engaged. The founding couple moved away from Rochester a few years ago, so our group lost a little momentum. We have met sporadically since then, as we are trying to find our new identity. 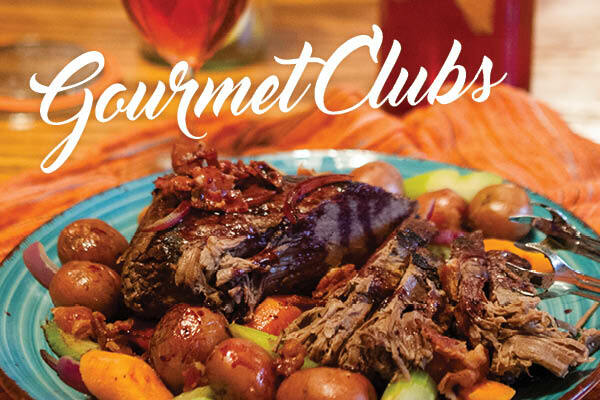 Another gourmet club in Rochester was started by Dawn Sanborn and Jorrie Johnson. Dawn wanted to combine her “love for food and friends,” while Jorrie wanted to try food and wine from around the world. They both wanted to “hang out with wonderful women, meet new friends and try real food and wine or cocktails common from other countries, almost like traveling without the airplane,” explains Sanborn. Sanborn explains that not everyone in the group loves to cook, “but everyone loves a good get-together, so some would even just buy something from a restaurant.” One time, the hostess ordered gyros from a Greek restaurant. They planned on meeting once a month and shared the hosting duties. They “went to” Australia, Brazil, Chili, Denmark, Ireland, India, Jordan, Kenya, Korea, Liechtenstein and tried lots of interesting recipes and foods. I had recently traveled to France and was eager to make some French food with my gourmet club. I found a delicious looking recipe for brisket in a French cookbook. I was hosting on a Friday, and my day was filled with appointments, so I knew I would be pressed for time. The recipe I found called for cooking the brisket at a slow temperature for three hours after searing it on the stove. I knew I wasn’t going to be able to get to that at the right time, so I searched for a slow cooker recipe. I ended up combining a couple different recipes to come up with the one that I’m sharing with you. This is a great recipe for hosting because you can make it ahead so that you can spend more time preparing for and spending time with your guests. Another make-ahead recipe for parties and events this holiday season is a punch. 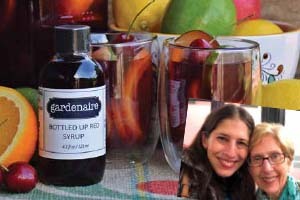 Try this festive red punch that looks delicious and can be made with or without alcohol. Would you like to start a gourmet club? You can make the group however you like it. You could cook or go out to eat and try different restaurants. You could have a formal club where everything is planned, or you could have a casual, potluck-style club. You could focus on a different type of food each time or maybe even a particular time period for your inspiration. Choose whatever you want the focus to be: social time, food or maybe wine. 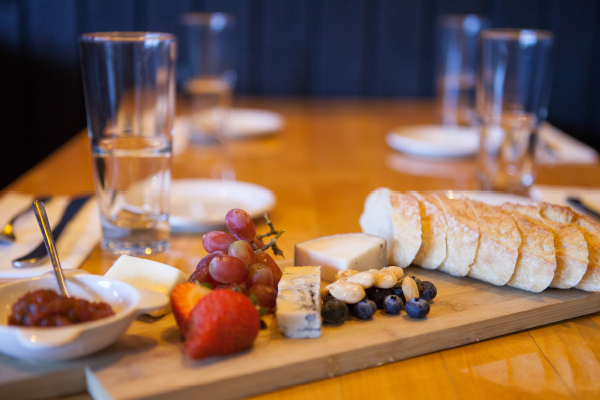 Gather a group of friends and enjoy food and time together. 1 beef brisket, 4-5 lb. Season brisket generously with salt, pepper, garlic and onion powder. Heat a large pan over medium-high heat and add olive oil to the pan. Add brisket and sear on each side, 2-3 minutes or until dark brown. Transfer to slow cooker. Add beef stock to cover brisket. Cook at low heat for 6-8 hours. About an hour before eating, fry the bacon in a large pan. Once crispy, pour off bacon fat, leaving 1 Tbsp. in the pan. Add onion, carrots, potatoes and celery to pan and cook over medium heat until onions are soft. Add garlic and saute 1 minute. Transfer vegetables to a bowl with the bacon and keep warm. Pour wine and cognac in the pan. Add 2 cups of broth from the slow cooker to the pan. Stir to remove bits from the pan. Cook over medium high heat for 30 minutes or until sauce has thickened, stirring frequently. Remove brisket from slow cooker and put on a platter, surrounding it with the vegetables and bacon. Sprinkle with chives if desired. Serve reduction sauce on the side. In a large bowl, over ice combine all of the liquid ingredients. Float the orange slices on top, for garnish and serve. Emily Watkins is personal trainer and freelance writer and editor. This entry was posted in Food on November 1, 2017 by By Emily Watkins Photography by Dawn Sanborn Photography. You’ve done the Great River Road Wine Trail and the Rochester Craft Beer Expo and maybe even a cidery tour or two. But have you ever gone to a tasting that includes all three types of beverages from over a dozen different makers under one roof, right in downtown Rochester, for only $25? If not, check out Feast! Local Foods Marketplace, the region’s largest local food festival, now in its fourth year. Unlike wine trails, this tasting doesn’t involve a long bus ride to Wisconsin or congestion in the Twin Cities. Instead, Feast! brings the best local wine, craft beer and cider to you at the Mayo Civic Center, Saturday, December 2, 2017 from 10 a.m. to 4 p.m. Plus, the ticket price includes a multitude of culinary treats, everything from farm-sourced cheddar to mouthwatering confections, all made by food artisans in Minnesota, Iowa and Wisconsin. First stop: Stagecoach Brewing Company, where fascinating stories, golden ales and smoky porters are on tap for Feast! Owned by local brew master Tod Fyten, Stagecoach will be serving up the brewery’s distinguished history, dating back to 1857 in Mantorville, as well as a tipple of their Smoked Porter, award-winning Honey Golden Ale and their flagship brew, Stagecoach Amber Ale, now celebrating its 20th anniversary. This entry was posted in Food on November 1, 2017 by By Marlene Petersen. Food trucks! Easy, quick and delicious food to eat while basking in the warm sun. Do they make you think of summer? 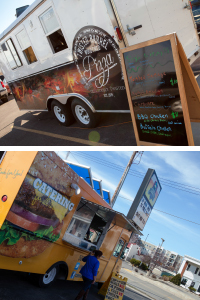 With a mobile food unit permit from the Rochester City Council, food trucks can set up in the designated zone downtown, on private or public property as approved. All licenses or permits required by the State Health Department or Olmsted County Public Health must be obtained as well. These permits help ensure food safety for consumers. This entry was posted in Food on April 25, 2017 by Emily Watkins Photography by Dawn Sanborn Photography. If you’re cracking open a bottle of wine on a regular basis, you probably have a small cellar or rack for adequate storage. If so, we have several suggestions from a few local wine clubs who hand-pick the perfect bottles of wine to help keep your cellar stocked and your glasses full. 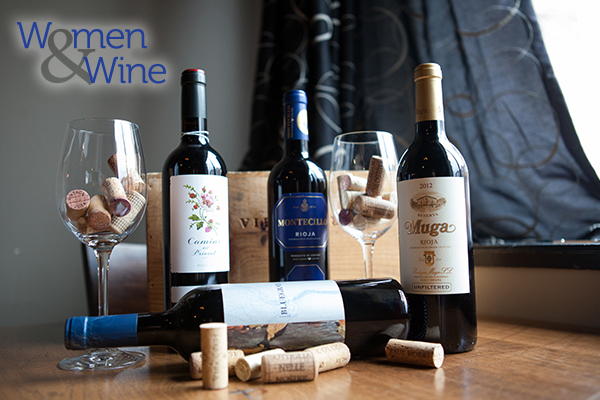 Explore Tessa’s Office wine boutique, a quaint little shop located in downtown Rochester. Although the boutique is small in size, there are more than 140 bottles of wine from around the world, all hand-picked by Tessa Leung and her team of wine experts. Tessa’s Office offers a three-tiered wine club, each with a clever title. The first tier is known as the Bud Break, which in wine terminology means when the grape starts its annual growth cycle. The first tier is an introduction to fabulous wines that won’t break the bank. Each month, you receive three bottles of wine for $50. Leung and her team selected three Spanish wines for the month of May, and for June there are three bottles of wine from Sonoma. This entry was posted in Food on April 25, 2017 by Nicole L. Czarnomski Photos by Dawn Sanborn Photography. I have a not-so-secret passion for France. I’ve studied the language and culture for almost 25 years and have lived, gone to school and worked there for a combined two years. French food provides vivid memories: creamy butter on fresh bread and croissants on a slow morning in Paris, fresh seafood on the coast of Brittany, lettuce tossed with vinaigrette, waiting for the cheese course after a long Sunday afternoon dinner with family. “Haute cuisine,” according to Wikipedia, is food served at “high level” establishments, gourmet restaurants and luxury hotels, characterized by meticulous preparation and careful presentation, at a high price level, enjoyed with expensive wines. While there are many restaurants like this in France (as well as here in the U.S.), by and large, the cooking that happens in the home in France is simple and straightforward, eating to savor delicious food while enjoying time with friends and family. Rochester is home to many classically trained chefs who add riffs to classic French fare. Bleu Duck Kitchen offers top-notch cuisine, wines and cocktails in a “fun-dining” atmosphere. Casablanca Creative Cuisine & Wine allows diners to get close to fine French dining without leaving the city limits, and owner and chef Youness Bojji might even teach you a little French. ZZest brings you the most amazing selection of cheeses from France and everywhere else, modern dishes and fabulous cocktails. All three restaurants present incredibly creative dishes that will delight your palette. This entry was posted in Food on March 7, 2017 by Emily Watkins Photography by Dawn Sanborn Photography. Champagne is a region in northern France where true champagne is made. In other countries it’s known as a sparkling wine. In the Champagne region, the climate is cool, and the soil is chalky and rocky. Growing in these elements keeps the grapes from losing their acidity, creating crisp, dry flavors. However, sugar can be added to champagne to add a touch of sweetness. 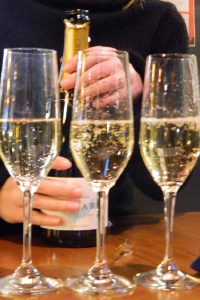 The three main grapes used to create champagne are chardonnay, pinot noir and pinot meunier. Champagne is not just for celebrations. Break out the bubbly on a random Tuesday evening and let the bubbles dance across your palate while dining on burgers, deep-fried cheese curds or fried chicken. Tessa Leung, owner of Tessa’s Office wine boutique, has a deeply rooted relationship with champagne. In fact, her dream job is to be a champagne ambassador. This entry was posted in Food on March 7, 2017 by Nicole L. Czarnomski. Villa Bellezza Winery and Vineyards, offering award winning wine and gourmet food, is worth the hour drive any time of year. Make a day of it and get some fresh air and exercise while you’re there this winter. 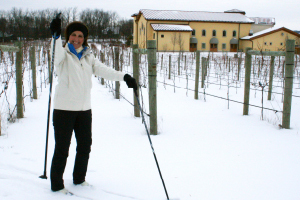 Villa Bellezza Winery and Vineyards is located in Pepin, Wisconsin. “Bellezza” is the Italian word for “beauty,” which aptly describes Villa Bellezza’s architecture and the surrounding valleys and scenic bluffs. The sprawling southern European-style building includes the tasting room, piazza, catering kitchen, reception hall, generously sized foyer, great hall or ballroom and luxurious apartments, perfect for pre-wedding preparations. Eighteen years ago, Derick Dahlen, owner and winemaker at Villa Bellezza, met restaurant owners Rosette and Maria in Minneapolis. Rosette and Maria, originally from Calabria, Italy, loved creating savory meals for their customers at Sorrento Cucina. Over the years, the Dahlen family developed a friendship with Rose and her husband, Umberto. Through Rose and Umberto, the Dahlens met the owners of a small farm and vineyard in Zagarollo, Italy. They experienced the delight in handmade things and wanted to create their own legacy. This entry was posted in Food on January 5, 2017 by Nicole L. Czarnomski.